We've been working with Dorset Market Kitchen (DMK) since early 2016. They have catered for our private party at The Melplash Show, a Partners' Meeting at Furleigh Estate, retirement party at Palmers Brewery, and for Christmas drinks at several of our Dorset Offices. We often see them at shows and other events across the region and find it difficult to resist starting the day with one of their bacon butties! We started Dorset Market Kitchen in November of 2015 after another summer period in the south of France, one of our favourite destinations (along with Dorset) as we love the culture and the food and drink scene. The French (like people in Dorset) take food and drink seriously as times to enjoy and come together. Before our parenting times we were frequent visitors to shows, festivals in and outside of Dorset and thought food traders were missing a trick. We have also been lucky enough to visit some amazing pop up's back in London when the street food scene really kicked off and took inspiration. We wanted to showcase all things local and celebrate all the hard work Dorset producers put in to creating some truly wonderful products by collaborating and promoting through our own pop up kitchen. Since then we have grown year on year, providing the best festivals and shows in Dorset with freshly cooked local produce, helping couples deliver amazing food on their wedding days and even corporate functions, which we love getting involved in with like-minded people. For Kieran it will be a hard choice as we spent just over a year with extensive product development, making sure we could cook our products fresh and source the ingredients within a 25 mile radius of our Kitchen. I think our steak and cheese will be noted as our customers favourite by still offering the choice of how you would like your steak cooked and using the finest locally sourced west country beef. What is your relationship with Porter Dodson? The team at Porter Dodson were introduced to us very early on in our venture, they have been an amazing supporter of ours. Our relationship has grown over the past three years not only by doing some collaborations and them supporting our business but on a more personal level with Rob and Paula taking a real interest in what we are doing, seeing our vision and offering friendly advice and a wealth of contacts in the industry. I would say the support has been paramount in the growing of our business and would advise others that they really are full founding supporters of the Dorset food and drink scene. For us, we take every step as it comes. We adapt to ever changing markets and conditions, the economy will have an effect on anyone in the retail business but we feel as more exposure is put on the way we consume and grow our food, Dorset producers will see a benefit as we truly believe our county is renowned for high welfare, high standards, traditional methods with a low impact on the environment. As a proud member of Dorset Food and Drink these issues are always a topic for discussion as we all work towards bettering our businesses. Exciting times ahead for us as we get closer to our "Made in Dorset Project" an area we can grow produce and raise livestock. We will be looking to open an educational area for local schools and pre-schools to spend time and help out from lambing, to feeding the pigs, to growing and learning about food in general and where it comes from. 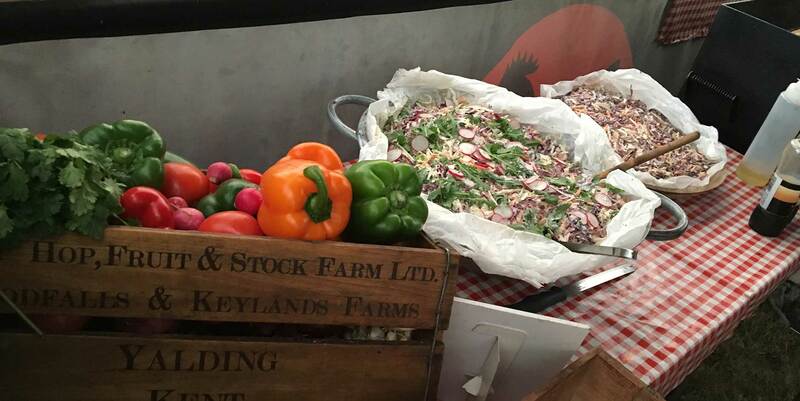 We will also be looking to hold open days and offer a corporate package as well as selling our produce with an onsite shop/cafe and farmers markets. Having two daughters, aged three and one, and from growing up on the out skirts of London their lives and upbringing will be totally different from ours. We love the fact we are five minutes from the sea and our walk through the village is green as far as the eye can see. Kieran still works in London doing kitchen residencies with Dorset Market Kitchen and we can all see his mood change when he is back on the beach! Our stand out menu item is DMK's Welsh Rarebit, which Kieran cooked outside in the rain in 2017 to ensure it was at its best for our Christmas guests!